Providing you the best range of reagent bottle with screw cap, reagent bottle and glass condenser with effective & timely delivery. Reagent Bottle with Screw Cap offered are mechanically strong, chemically resistant and are provided with plastic Pouring rings for drip-free operation. All bottles starting from 100 ml have only one size of Screw Thread. Screw Caps and Pouring Rings are interchangeable and are made from PP. 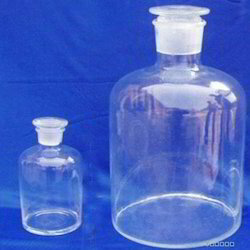 The bottles, Screw Caps and Pouring Rings can be sterilized. 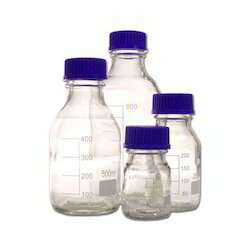 Reagent Bottle offered comprises GI-2611 these bottles can be used as delivery, storage container for solutions and come with sturdy caps with heavy duty finish which also makes these safe for storing or dispensing distilled chemicals as well as other laboratory solutions. 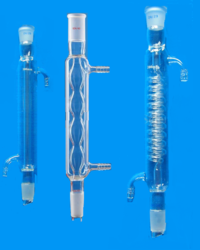 We are recognized as successful manufacturer of Glass Condenser. This one is a simple condenser design used to cool and condense hot vapor as part of a distilling apparatus. This correctly designed condenser has a straight inner tube that the condensing vapor passes through and a large outer jacket that cooling water passes through. These are made available to the customer at industry leading rates.